Hello Sweeties! Today I have a gorgeous collection I have been dying to share with you! 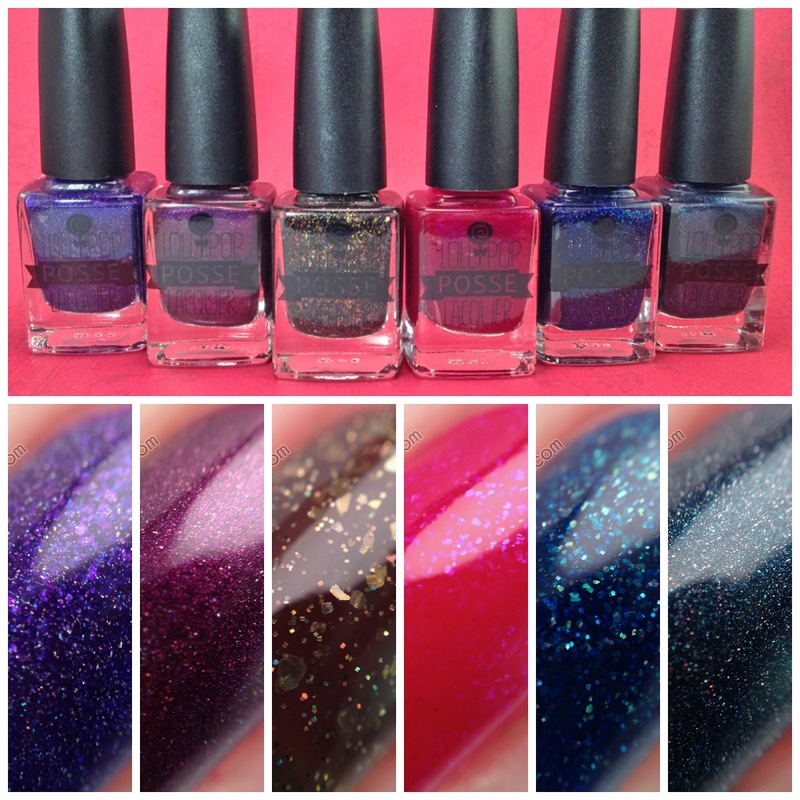 Meet the Midsummer Midnight Collection by Lollipop Posse Lacquer. The Midsummer Midnight's Collection is a posse of six lacquers in various darker, more in-depth shades to take you into the heat of midsummer. This collection was inspired by memories of hot summer nights filled with endless possibilities and a lot of self-discovery. "Do I stress you out? My sweater's on backwards and inside out, and you say how appropriate." ~Alanis Morissette, "All I Really Want"
Backwards and Inside Out is described as a linear holographic polish with a dark green base that will show a subtle, sometimes hidden, shift to navy blue. I used three thin coats to achieve full opacity and sealed it with a glossy top coat. This is my favorite from this collection. The combo between the blue and green base gave it a beautiful deep teal shade which I simply adored! "This fruit was bruised, dropped off and blue. Out of season, happy I'm bleeding. Long overdue. Too early and it's late too." ~PJ Harvey, "Happy and Bleeding"
This Fruit Was Bruised is described as a deep, bruised burgundy/purple linear holographic. I used two coats to achieve full opacity and sealed it with a glossy top coat. Formula was great and applied evenly. This is my second favorite from the collection. "I miss you, but I haven't met you yet. So special, but it hasn't happened yet. You are gorgeous, but I haven't met you yet. I remember, but it hasn't happened yet." ~Bjork, "I Miss You"
But I Haven't Met You Yet is described as a deep red, pink-leaning crelly with pink micro flakies to create depth. I used two coats to achieve full opacity and sealed it with a glossy top coat. Formula was great and no fishing needed for any of the micro flakies. For me, this polish applied and looked more like a squishy jelly polish. "Pulling heads off Barbies, sticking them on the TV antenna and ruining the reception. But that's how witch babies are." ~Francesca Lia Block, from her novel "Weetzie Bat"
That's How Witch Babies Are is described as a vivid blurple crelly base with neon purple flakies and a scattered holographic effect. I used three coats to achieve full opacity and sealed it with a glossy top coat. First coat was a bit sheerer then I expected but it built up nicely by the third coat. "I shut my eyes and all the world drops dead; I lift my lids and all is born again. (I think I made you up inside my head.)" ~Sylvia Plath, from her poem "Mad Girl's Love Song"
Inside My Head is described as a black jelly base that suspends a dusting of micro holographic gold glitter and multiple sizes of gold flakes. I used two coats to achieve full opacity and sealed it with a glossy top coat. Formula was great and applied very easily, no fishing needed for the flakies. Once applied this looked more like a dark brown jelly base then a black, in my opinion, but still a really pretty shade. "The looking glass, so shiny and new. How quickly the glamour fades. I start spinning, slipping out of time. Was that the wrong pill to take?" ~Florence and the Machine, "Rabbit Heart (Raise It Up)"
Slipping Out Of Time is described as a navy crelly base that suspends blue-gold shifting flakies and sparkling silver holographic glitters. I used two coats to achieve full opacity and sealed it with a glossy top coat. Great formula and application. My camera went all sorts of crazy trying to capture this beauty outside! It just couldn't handle its bright and holo goodness haha! Overall, Every single one of these polishes are amazing! Not only is every formula spot on but they are beautiful as well. I am a sucker for dark polishes and holos so I will have to definitely say that this is one of my favorites of any collection I have reviewed! I still can't believe that this is only Lollipop Posses's second collection. The way her polishes are made you would think she has been in the business for years! Well Done Karen! This collection is releasing this Monday, July 13th, at 12pm EDT. The holographic polishes will be sold for $11 each while the other 3 shades retail for $9.50. The full collection will be available at a discounted price of $57 plus free US shipping. For more info please visit the links below! Amazing collection and awesome swatches! All the shades are impressive in this collection! I've really liked what I have seen so far from the brand. I really like Inside My Head! I kind of like that it is brown instead of black. Oh my, these are amazing. My heart stopped when I saw the bruising fruit, I never knew I would be so happy to see that phenomenon! Amazing swatches. Wow, these polishes are stunning! This brand is killing it haha! I like all of these but The Fruit was Bruised is a stunning polish!